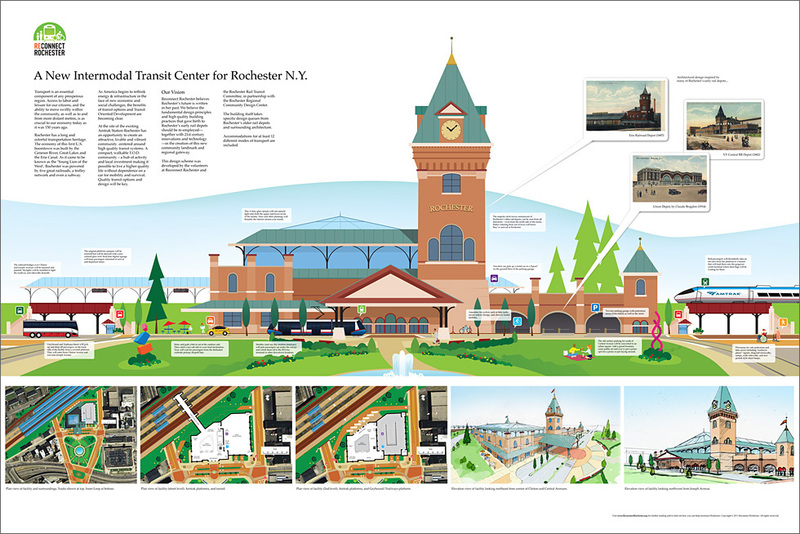 A New Intermodal Station for Rochester, New York. 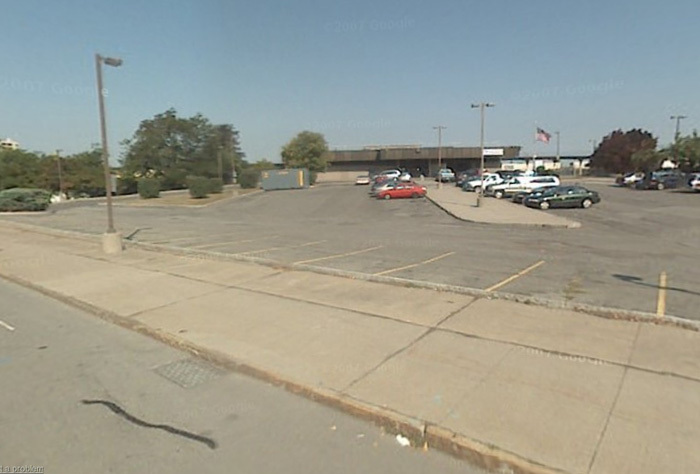 If you haven’t heard, the City of Rochester is requesting proposals for a new combined Amtrak/Greyhound/Trailways station. We don’t know about you, but we’re giddy with excitement. 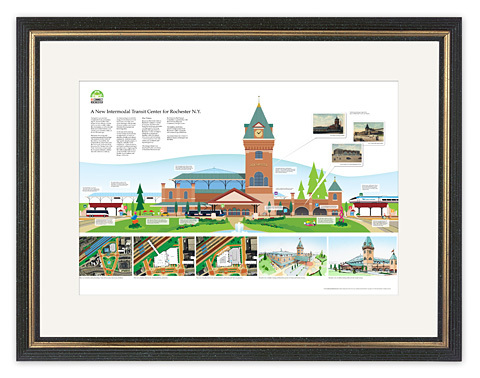 Rochester has had more than its share of great transit stations – sadly, many have been lost to history. Now, finally we have an opportunity to build a respectable gateway to Rochester that will serve our region well and become a landmark for many many generations. Reconnect Rochester is not standing idly by. You know what they say about idle hands. Well these hands have been busy drawing up our own vision for the most perfect intermodal transit station Rochester is certainly deserving of. We hope you feel this design is cool enough to share. Share it on Facebook. Email it to a friend or your local officials and representatives. Help us make this concept a reality. Members of Reconnect Rochester had a unique opportunity Monday afternoon. We were invited to sit in and participate in a roundtable discussion featuring representation of the Genesee Transportation Council, the Empire State Passengers Association, the Rochester Rail Transit Committee, and the keynote speaker of that evening’s lecture, John Robert Smith. Not all of the biggest statements came from Smith himself, but his insight into federal agencies and funding acquisition from said agencies was very valuable to our coalition. Also heartening was the recognition by all parties of potential energy realities. 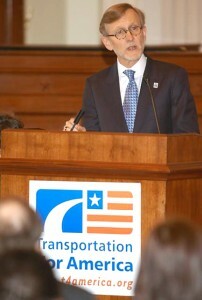 This acceptance set the imperative tone regarding the necessity for improved transit in the region. Smith’s greatest criticism, one that was repeated during the public lecture, was a lack of obvious attraction marketing, and the associated transportation options, to downtown hotel guests and travelers who arrive by train. The implication is that we aren’t successfully steering travelers with money to spend to restaurants and other cultural amenities. A set of newer signage as part of an enhanced wayfinder system was installed recently, but it is proving to be geared toward motorized tourist travel.